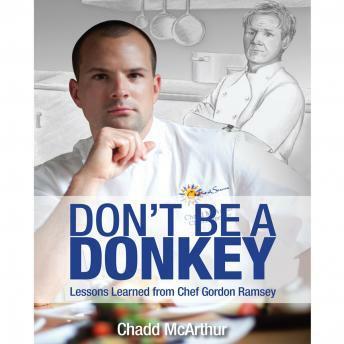 'Don't be a Donkey is a true story about the life and career of Chef Chadd McArthur. It is about the lessons, about both kitchen and life, that he learned while working for Gordon Ramsay. Eighteen hours a day, five days a week... when you work with a great chef and leader that much, his wisdom will rub off on you, and at times traumatize you. The lessons learned will stick with Chef McArthur for the rest of his life, and now, with funny stories and clever insights into working with one of the world's most well-known chefs, he's sharing them in this very audiobook. From having Chef Gordon Ramsay himself fling a ravioli at him, to the integrity with which Ramsay dealt with the death of a colleague, Chef McArthur has a lot to tell about his three years spent working in Ramsay's flagship restaurant in London, sometimes directly under the man himself. Each chapter also includes a recipe, some created wholly by the author,and some influenced by Chef Ramsay's own signature dishes. Enjoy this fresh new take on Gordon Ramsay, and the challenges of a chef who survived Ramsay's kitchen for years.